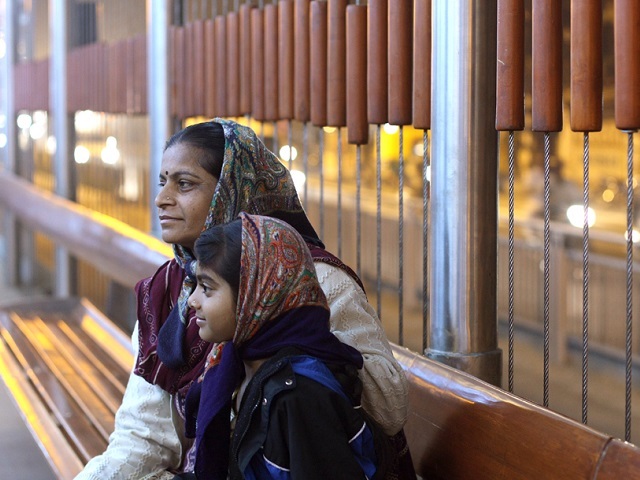 A mother and daughter wait for Ahmedabad, India’s bus rapid transit (BRT) system, the Janmarg. Transforming Transportation 2014 concluded with four parallel sessions a final closing plenary. Photo by Meena Kadri/Flickr. Cropped. 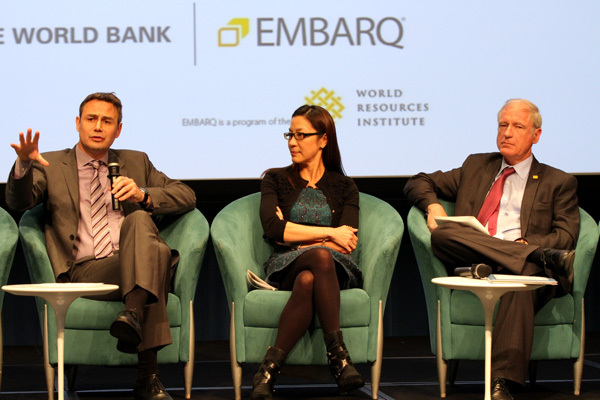 EMBARQ, the sustainable urban transport and urban development program of the World Resources Institute (WRI), and the World Bank co-organized Transforming Transportation on January 16 and 17 in Washington, D.C. For more information about this year’s conference, visit www.transformingtransportation.org and see TheCityFix’s live coverage from the event. The final afternoon of Transforming Transportation 2014 featured four parallel sessions followed by the conference’s fifth and final plenary, “Sustainable Development Goals and Transport: A Coalition for Change.” The first parallel session, “Emerging Markets: Advance Mobility Planning for the Next Megacities” is key to the discussion on one of the five opportunities for 21st-century transport identified in advance of Transforming Transportation – mid-sized cities. The other parallel sessions included “Small and Medium Enterprises for Mobility,” “Secure Public Transport,” and a PechaKucha 20×20 style forum for young innovators. The “Emerging Markets” session focused on mid-sized cities and the opportunities they face as they undergo rapid urban growth. In particular, cities like Jinan, China; Belo Horizonte, Brazil; and Indore, India – considered second-tier cities yet already boasting over one million inhabitants each – have the opportunity to leap-frog car dependent policies and adopt a sustainable urban model. By avoiding lock-in effects, these cities can change the course of urbanization in emerging economies. Sam Zimmerman, Urban Transport Advisor, The World Bank, moderated the “Secure Public Transport” session, introducing the topic with a clear delineation between safety and personal security on public transport. Personal security refers specifically to individual security related to instances of crime. The panelists for the session were Julie Babinard, Julie Babinard, Senior Transport Specialist, Transport Unit of the Transport, Water and Information and Communication Technology Department, The World Bank; Gwen Kash, PhD Student, Department of City and Regional Planning, University of North Carolina at Chapel Hill; Salvador Herrera, Deputy Director, EMBARQ Mexico; and Heather Allen, Transportation Research Laboratory (TRL). Opening the session with a brief presentation, “Addressing Personal Security in Public Transportation,” Babinard offered a useful definition of personal security in public transport: “The ability, without the fear of being victimized, to: use public transportation, walk from or to the transit stop, and wait at a bus, transit stop or station platform.” Building on that definition, she identified several key issues around securing public transport. Globally, harassment on public transport – whether verbal or physical – is an under-reported problem, largely because victims may be afraid to report transport crimes to authorities. Further, crime affects all users regardless of gender or age, and influences use of various modes of transport. Babinard also summarized technical and urban design factors that can decrease crime around public transport, including surveillance cameras, pedestrian presence, bus shelters, and centers of commercial activity. Much of the discussion generated by the panel discussion that followed Babinard’s presentation focused on women’s use of public transport and the oft-cited yet controversial solution of providing women’s only sections on public transport systems. Research shows that women have a heightened sense of risk in urban environments, and their anticipation of risk influences their mode of transport choice. And while globally women do tend to make more trips using public transport than men, Babinard and Zimmerman – in line with the World Bank policy – urged that women’s only segregation on public transport should be considered a temporary fix. They argued that it is not cost-effective, not inclusive, and since women represent over half of the population, segregation is not a sustainable solution. 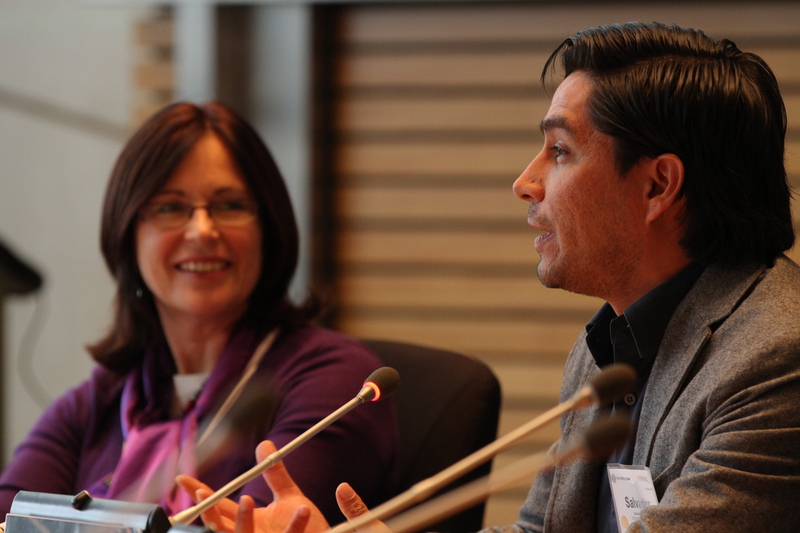 From left to right: Panelists Heather Allen and Salvador Herrera during the “Secure Public Transport” session at Transforming Transportation 2014. Photo by Aaron Minnick/EMBARQ. Safety is even more important than affordability. The final plenary of Transforming Transportation 2014, “Sustainable Development Goals and Transport: A Coalition for Change,” explored two crucial processes for the transport sector: the creation of the United Nations’ Sustainable Development Goals (SDGs) and global climate change negotiations. And moderator Cornie Huizenga, Joint Convener, Partnership for Sustainable Low Carbon Transport (SLoCaT), opened the plenary with an honest question – can the transport community do both, or do we have to choose one to focus on? The panelists of the final plenary were Tyrell Duncan, Director, East Asia Region, Transport Division, Asian Development Bank; Dirk John, CEO, Business Road and City Mobility, Siemens AG, Infrastructure & Cities Sector; Andreas Kopp, Lead Transport Economist, The World Bank; Aymen Ali, Transport and Information Communication Technology, African Development Bank; Michael Replogle, Founder, Managing Director of Policy, Institute for Transportation & Development Policy (ITDP); Kitty van der Heijden, European Director, WRI and former Ambassador for Sustainable Development of the Ministry of Foreign Affairs of the Netherlands; and Sudhir Krishna, Secretary, Ministry of Urban Development, India. Tyrell Duncan opened the session with a presentation on the progress of the commitment by the eight largest MDGs to invest US $175 billion in sustainable transport over the coming decade. While discussing next steps for the MDGs in implementing this commitment, he stressed the importance of considering the various components of sustainability – economic, environmental, and poverty and social. 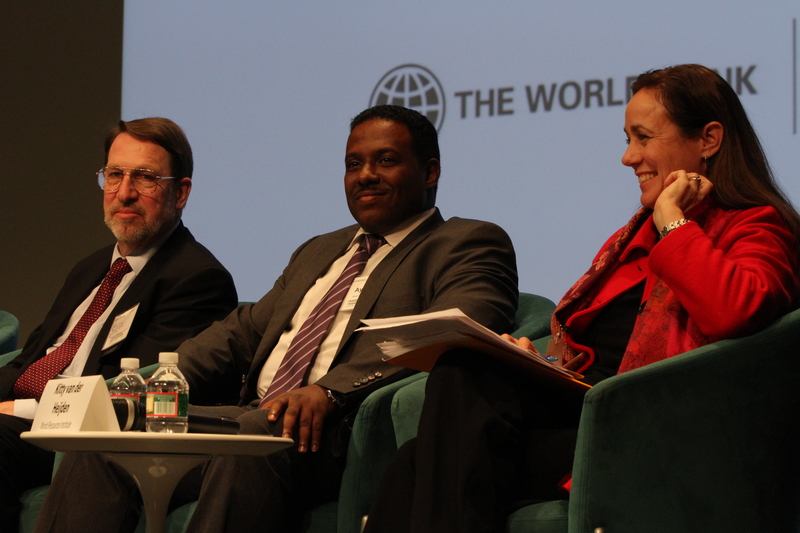 From left to right: Panelists Michael Replogle, Aymen Ali, and Kitty van der Heijden during the “Sustainable Development Goals and Transport” plenary at Transforming Transportation 2014. Photo by Aaron Minnick/EMBARQ. Other highlights of the plenary included Replogle’s reflections on the transformation of the transport sector since the mid-1980s, and van der Heijden sharing her perspective from the government sector on the perseverance of the transport community. The plenary concluded with the announcement of a new initiative called Transport Delivers, led by the Partnership on Sustainable Low Carbon Transport (SLoCaT), the goal of which is to define and set methods for achieving bold, ambitious sustainable transport goals within the broader framework of sustainable development. Michelle Yeoh – the Global Ambassador for the Make Roads Safe Campaign and noted actress – joined Jose Luis Irigoyen and Holger Dalkmann in delivering closing remarks at Transforming Transportation. This year’s conference had record participation with over 1,000 registered participants and 90 speakers from four continents. The #TTDC14 online conversation also had participation from 371 locations across five continents. Given this momentum, Transforming Transportation marked a great opportunity to influence the debate as the United Nations and countries around the world determine the post-2015 global development agenda at upcoming international summits. Most importantly, Transforming Transportation was an important moment for leaders in the transport, development, and business communities to come together and discuss a share vision of what sustainable transport is, along with the five key opportunities for transport of the 21st century: road safety, mid-sized cities, regional and local leadership, finance, and data and technology. From left to right: Holger Dalkmann, Michelle Yeoh, and Jose Luis Irigoyen give closing remarks at Transforming Transportation 2014. Photo by Aaron Minnick/EMBARQ. Those of us who champion for global road safety face challenges worthy of a Hollywood blockbuster. This concludes TheCityFix’s live coverage of Transforming Transportation 2014, but stay tuned for follow-up coverage next week. Thanks to everyone on-site and online who participated in the #TTDC14 dialogue, making this year’s conference the largest and most interactive yet. Tags: climate change, EMBARQ, International Climate Policy, North America, road safety, sustainable cities, The World Bank, Transforming Transportation, TTDC14, UN Sustainable Development Goals, United States, urban development, urbanization, Washington, D.C.